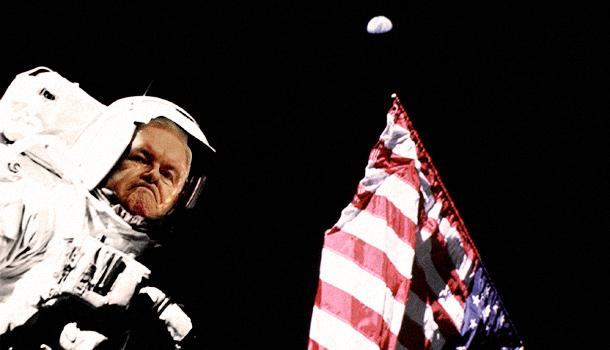 Newt Gingrich’s bold plans for a moon base dominated last night’s GOP debate. If he did get elected president–it could happen!–here’s how Newt’s bigger take on innovation and science would change America. Newton Leroy Gingrich–Newt to you and me–would most certainly write this post differently. Likely with more bluster, a dab of controversy and some tough language–because he is, in his own humble opinion, a “grandiose thinker.” But still, looking at some of the things he’s said in the past and more recently as he’s campaigned around America, here’s a look at how the former history teacher (with a PhD in modern European history!) may transform American innovation, science, and techology if he somehow secured the Oval Office hot seat. “By the end of my second term, we will have the first permanent base on the moon, and it will be American” is the bold statement Newt made this week. That means that by 2020 he will have injected enough cash into the U.S. space effort to develop the necessary launch vehicles, trans-global spaceships for astronauts and cargo, landing craft and habitation landing craft/permanent installations as well as to develop all the necessary training, ancillary science such as food production and backup services, like a reliable and continuous resupply chain. But Newt wouldn’t do this wholly via NASA, which he views as overly bureaucratic and deserving of funding cuts. Instead he’d distribute the cash via $10 billion “prizes,” something akin to the X-Prize that drove the first private human space launch via SpaceShipOne. He’s apparently “sick of being told we have to be timid,” and “sick of being told we have to be limited to technologies that are 50 years old.” And he’d apparently be determined to push ahead alone, in a spacecraft painted red, white, and blue (and maybe silver, ‘coz that unfiltered sun in space is darn hot), even if it meant shunning recent overtures from Russia and the EU to develop a multinational effort to create a moon base. But wait–didn’t Neil Armstrong plant that flag for “all mankind“? Newt has been accused of being a bit… undecided about climate change. With the U.S. as a rampant consumer of oil, coal, gas and with a populace whose rabid consumer habits generate megatons of waste, the nation has quite the climate-damaging reputation to make amends for (and even President Obama is a bit slapdash with his statistics on current efforts). So, back in 2000 Newt told Science that he’d advocate more spending on science and research, particularly on NOAA’s efforts at climate reasearch. Other pro-science efforts, including action on acid rain, have illuminated his earlier political career in a pretty positive light. But then in November 2011 he told Bill O’Reilly: “I think the evidence is not complete, and I think we’re a long way from being able to translate a computer program into actual science.” Which we can read not exactly as global warming denial, but as a reconsideration of the importance of climate change and efforts to both understand it and act to fix it. And then recently he reportedly cut a chapter on climate change from his upcoming book. Are Newt’s political ambitions, in cahoots with the Repubican Party’s larger political agenda, getting in the way of his pro-science thinking on this topic? That last bit actually sounds like it would make the most difference, though he’d have to tackle pro “intelligent design” politicians, counteract bad-mouthing of geeks and nerds, and actually find ways to spend money on science over other traditionally well-funded GOP institutions, such as the military. So as well as digging science, Newt is fond of those lovely people in white coats: Scientists, or shall we get chummy and call them boffins? Except, that is, unless they’re Iranian scientists working on nuclear matters. In which case, they should be shot. Speaking during his nationwide tour in November, Gingrich gave an indication that innovation is how he thinks the United States can move forward into the future, undoing the mistakes of previous administrations. [Innovation’s] the path America has followed for almost all of American history, it’s doing new things differently, it’s finding better outcomes. The answer to the stage coach turned out not to be better horses or better axle grease. It turned out to be the automobile. No government committee studying stage coach improvement could’ve come up with automobiles. Very innovative thinking. Or is it?